A North American leaf with multiple colors across it. Autumn leaf color is a phenomenon that affects the normal green leaves of many deciduous trees and shrubs by which they take on, during a few weeks in the autumn season, various shades of red, yellow, purple, black, orange, pink, magenta, blue and brown. The phenomenon is commonly called autumn colours or autumn foliage in British English and fall colors, fall foliage or simply foliage in American English. A green leaf is green because of the presence of a pigment known as chlorophyll, which is inside an organelle called a chloroplast. When abundant in the leaf's cells, as during the growing season, the chlorophyll's green color dominates and masks out the colors of any other pigments that may be present in the leaf. Thus, the leaves of summer are characteristically green. Chlorophyll has a vital function: it captures solar rays and uses the resulting energy in the manufacture of the plant's food — simple sugars which are produced from water and carbon dioxide. These sugars are the basis of the plant's nourishment — the sole source of the carbohydrates needed for growth and development. In their food-manufacturing process, the chlorophylls break down, thus are being continually "used up". During the growing season, however, the plant replenishes the chlorophyll so that the supply remains high and the leaves stay green. The reds, the purples, and their blended combinations that decorate autumn foliage come from another group of pigments in the cells called anthocyanins. Unlike the carotenoids, these pigments are not present in the leaf throughout the growing season, but are actively produced towards the end of summer. They develop in late summer in the sap of the cells of the leaf, and this development is the result of complex interactions of many influences—both inside and outside the plant. Their formation depends on the breakdown of sugars in the presence of bright light as the level of phosphate in the leaf is reduced. The brilliant red autumn color of some species of maple is created by processes separate from those in chlorophyll breakdown. When the tree is struggling to cope with the energy demands of a changing and challenging season, maple trees are involved in an additional metabolic expenditure to create anthocyanins. These anthocyanins, which create the visual red hues, have been found to aid in interspecific competition by stunting the growth of nearby saplings (allelopathy). Although some autumn coloration occurs wherever deciduous trees are found, the most brightly colored autumn foliage is found in four or five regions of the world: most of southern mainland Canada; and some areas of the northern United States, Scandinavia, Northern, and Western Europe north of the Alps; the Caucasus region near the Black Sea, Russia; and Eastern Asia, including much of northern and eastern China, as well as Argentina, Chile, southern Brazil, Korea, Japan and New Zealand's South Island. Compared to Western Europe, North America provides many more arbor species (more than 800 species and about 70 oaks, compared to 51 and three, respectively, in Western Europe) which adds many more different colors to the spectacle. The main reason is the different effect of the Ice ages — while in North America, species were protected in more southern regions along north–south ranging mountains, this was not the case in Europe. 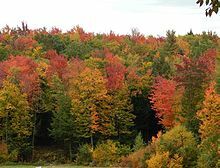 Global warming and rising carbon dioxide levels in the atmosphere may delay the usual autumn spectacle of changing colors and falling leaves in northern hardwood forests in the future, and increase forest productivity. Experiments with poplar trees showed that they stayed greener longer with higher CO2 levels, independent of temperature changes. However, the experiments over two years were too brief to indicate how mature forests may be affected over time. Also, other factors, such as increasing ozone levels close to the ground (tropospheric ozone pollution), can negate the beneficial effects of elevated carbon dioxide. ^ "The Science of Color in Autumn Leaves". usna.usda.gov. United States National Arboretum. October 6, 2011. Archived from the original on 2015-05-03. Retrieved 18 June 2015. ^ Wade, Paul; Arnold, Kathy (16 September 2014). "New England in the Fall: Trip of a Lifetime - Telegraph". telegraph.co.uk. The Daily Telegraph. Retrieved 18 June 2015. ^ "BBC - Gardening - How to be a gardener - The gardening year - Autumn's theme". bbc.co.uk. BBC. 17 September 2014. Retrieved 18 June 2015. ^ "US Forest Service - Caring for the land and serving people". fs.fed.us. United States Forest Service. 2014. Retrieved 18 June 2015. 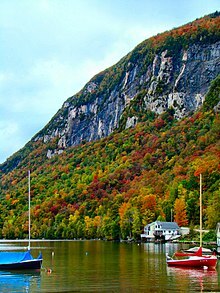 ^ "MaineFoliage.com - Maine's Official Fall Foliage Website". MaineFoliage.com. MaineFoliage.com. 2013. Retrieved 18 June 2015. ^ a b c d e f g h Archetti, Marco; Döring, Thomas F.; Hagen, Snorre B.; Hughes, Nicole M.; Leather, Simon R.; Lee, David W.; Lev-Yadun, Simcha; Manetas, Yiannis; Ougham, Helen J. (2011). "Unravelling the evolution of autumn colours: an interdisciplinary approach". Trends in Ecology & Evolution. 24 (3): 166–73. doi:10.1016/j.tree.2008.10.006. PMID 19178979. ^ Horie, Y.; Ito, H.; Kusaba, M.; Tanaka, R.; Tanaka, A. (2009). "Participation of Chlorophyll b Reductase in the Initial Step of the Degradation of Light-harvesting Chlorophyll a/b-Protein Complexes in Arabidopsis". Journal of Biological Chemistry. 284 (26): 17449–56. doi:10.1074/jbc.M109.008912. PMC 2719385. PMID 19403948. ^ Zelisko, A.; Garcia-Lorenzo, M.; Jackowski, G.; Jansson, S.; Funk, C. (2005). "AtFtsH6 is involved in the degradation of the light-harvesting complex II during high-light acclimation and senescence". Proceedings of the National Academy of Sciences. 102 (38): 13699–704. Bibcode:2005PNAS..10213699Z. doi:10.1073/pnas.0503472102. PMC 1224624. PMID 16157880. ^ Hortensteiner, S. (2006). "Chlorophyll degradation during senescence". Annual Review of Plant Biology. 57: 55–77. doi:10.1146/annurev.arplant.57.032905.105212. PMID 16669755. ^ Davies, Kevin M. (2004). Plant pigments and their manipulation. Wiley-Blackwell. p. 6. ISBN 978-1-4051-1737-1. ^ Thomas, H; Stoddart, J L (1980). "Leaf Senescence". Annual Review of Plant Physiology. 31: 83–111. doi:10.1146/annurev.pp.31.060180.000503. ^ Labandeira, C. C.; Dilcher, DL; Davis, DR; Wagner, DL (1994). "Ninety-seven million years of angiosperm-insect association: paleobiological insights into the meaning of coevolution". Proceedings of the National Academy of Sciences. 91 (25): 12278–82. Bibcode:1994PNAS...9112278L. doi:10.1073/pnas.91.25.12278. PMC 45420. PMID 11607501. ^ Lee, David; Gould, Kevin (2002). "Why Leaves Turn Red". American Scientist. 90 (6): 524–531. Bibcode:2002AmSci..90..524L. doi:10.1511/2002.6.524. ^ Lee, D; Gould, K (2002). "Anthocyanins in leaves and other vegetative organs: An introduction". Advances in Botanical Research. 37: 1–16. doi:10.1016/S0065-2296(02)37040-X. ISBN 978-0-12-005937-9. ^ Archetti, M; Brown, S. P. (June 2004). "The coevolution theory of autumn colours". Proc. Biol. Sci. 271 (1545): 1219–23. doi:10.1098/rspb.2004.2728. PMC 1691721. PMID 15306345. ^ a b Archetti, M. (2009). "Evidence from the domestication of apple for the maintenance of autumn colours by coevolution". Proceedings of the Royal Society B: Biological Sciences. 276 (1667): 2575–80. doi:10.1098/rspb.2009.0355. PMC 2684696. PMID 19369261. ^ a b Hamilton, W. D.; Brown, S. P. (2001). "Autumn tree colours as a handicap signal". Proceedings of the Royal Society B: Biological Sciences. 268 (1475): 1489–93. doi:10.1098/rspb.2001.1672. PMC 1088768. PMID 11454293. ^ Lev-Yadun, Simcha; Dafni, Amots; Flaishman, Moshe A.; Inbar, Moshe; Izhaki, Ido; Katzir, Gadi; Ne'eman, Gidi (2004). "Plant coloration undermines herbivorous insect camouflage". BioEssays. 26 (10): 1126–30. doi:10.1002/bies.20112. PMID 15382135. ^ "Pest Alert". South Dakota State University. August 30, 1998. Archived from the original on 2006-10-20. Retrieved 2006-11-28. ^ Altman, Daniel (November 8, 2006). "Fall foliage sets Japan ablaze". Taipei Times. Retrieved 2006-11-28. ^ a b Taylor, Gail; Tallis, Matthew J.; Giardina, Christian P.; Percy, Kevin E.; Miglietta, Franco; Gupta, Pooja S.; Gioli, Beniamino; Calfapietra, Carlo; Gielen, Birgit (2007). "Future atmospheric CO2 leads to delayed autumnal senescence". Global Change Biology. 14 (2): 264–75. Bibcode:2008GCBio..14..264T. CiteSeerX 10.1.1.384.1142. doi:10.1111/j.1365-2486.2007.01473.x. ^ "Forests Could Benefit When Fall Color Comes Late". Newswise. Retrieved 2008-08-17. This page was last edited on 24 April 2019, at 04:00 (UTC).